p>A genuinely peach colored bud, the Osiana rose is a true spectacle to behold. 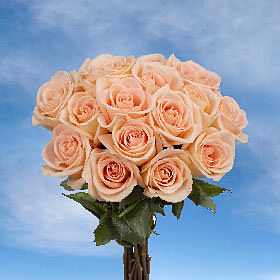 The peach color of this blossom has caused confusion as to where and when to use this flower, but Globalrose is here to dispel any problems. It is often regarded as an alternative to pink but without losing any of the meaning and feeling of a pink bud. Great for Valentine's Day Events, Easter Festivities, and spring Weddings, this blossom is rather versatile and can fit into any occasion where the theme is love and romance. At Globalrose we believe the environment comes first. We have equipped all of our facilities with the most environmentally friend tools and have taught our employees that Mother Nature comes first, because without her we would have no blossoms. Our greenhouses are located in some of the sunniest locals in Colombia which allows USA to harvest nature's bounty all year round. We prepare all our florets in a special way so that they arrive to your doorstep fresh, guaranteed. Please give your Osiana rose bushel at least seventy-two hours for them to fully bloom. We ship all of our products through FedEx, an industry leader, to make sure all orders arrive where and when they need to. We provide free shipping to all continental USA customers.